In ancient India, a sacred thread is draped about the body of a person who dedicates all of life to honoring the sacred. Anne sees the sacred threads linking the many fabrics of her own life. These pages highlight several of the sacred threads in Anne's life. Mother, Father, Grandmothers, Grandfathers--artists all, in public and in private... they are threads connecting Anne to the souls of the past, giving our shared love to souls of the present and future. 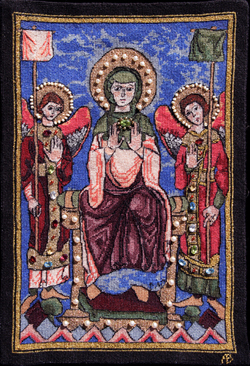 Sacred Threads also describe Anne's miniature tapestries, in fine silk with gemstones and pearls, adapted from illuminated manuscripts of the early medieval period. These tapestries are tiny icons (less than a typing page in size) of 500 stitches per square inch. Each stitch is a meditation, and the icons become energy portals, linking the viewer with the thousands of years and millions of souls who held these images sacred over the millenia. These images have been exhibited in Texas galleries and have been sold to collectors across the country. You can view them under the Tapestries menu item above, and they are available for purchase. Constellating Love is a workshop based on the Systemic Constellation techniques of Germany's sage, Bert Hellinger. 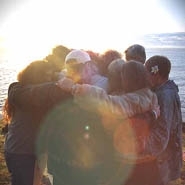 In these workshops the sacred thread between generations is exposed and renewed, healing family trauma of generations past, and renewing life's opportunities for those of us in the present. Thank you for stepping into the space of Sacred Threads. It is my hope that these treasures of silk and jewels will offer you a small epiphany of joy and love for the sacred in life. The phenomenal effects of systemic constellation work, as developed by Germany's sage, Bert Hellinger, can be life-changing. It is certainly world-view changing, as you are able to see and feel that every human is connected; that there is a "knowing field" that contains all knowledge; and this "knowing field" can be accessed at any time for purposes of healing and reconnecting. With little or no knowledge of the others in the group, we actually see and experience the events of ancestors which, beneath the surface, have shaped and molded our own lives. This work allows us to disconnect the ties that bind too tightly, and recognize the sacred thread of love that links our past, present, and future. For more information about Constellation Workshops, see Constellating Sacred Threads in the menu bar. 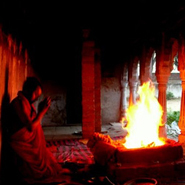 Ranging from the spiritual technologies of India (pujas, yagyas, specifically identified service work, and mantras) to Constellating Sacred Threads workshops, to the use of essential oils and ORMUS, there are many modalities available to us for spiritual and personal growth. As I continue to grow and learn, I will continue to share what I know with you. 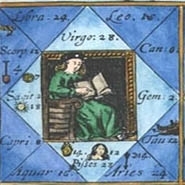 Anne is a long-time astrological counselor, using techniques from Western Astrology, and from Jyotisha, the astrology of India (sometimes called Vedic, or Hindu Astrology). The symbol systems of the astrological tradition are incredibly rich, and allow us to gain a deeper understanding of our personal processes through life, and how best to plan for our continued growth and development. Using both traditions gives Anne an unusual level of insight into how our lives work.